Since Trump's election, I feel as though we're on the edge of living in a dystopian novel, like The Handmaid's Tale or Hunger Games. Trump isn't even in office yet, and human rights are already disappearing. The governor of Ohio, John Kasich, just signed a law outlawing abortions after 20 weeks. The president-elect repeatedly attacks expressions of free-speech, such as the Hamilton cast's address to Mike Pence and every single SNL Trump parody. As Trump fills his cabinet with mostly white, male millionaires, America seems to be backsliding dangerously into a conservative, nationalist state. Unfortunately, America is not the only country backsliding. Read or watch the news and you'll see this nationalist, xenophobic trend growing worldwide. Brexit in the United Kingdom and the National Front in France are just two examples. And if we're talking about a dystopian world, we should look no further than the civil war in Syria and the fall of Aleppo. What began as simple protests for political reform morphed into the greatest humanitarian tragedy in decades, resulting in the senseless massacre of helpless civilians. As trapped families broadcast their final goodbyes from Aleppo, the international community stood idly by. If anyone questions whether history repeats itself, today's current events answer with a resounding YES. As 2017 approaches, I'm filled with dread instead of hope. Perhaps I am too negative and focusing only on the bad in the world, but I can acknowledge the good as well. Great advances in medicine and technology have improved our quality of life. Instances of kindness and goodness continually fight their way to the surface. And if nothing else, the Internet provides countless memes and videos to give us a laugh. Educate yourself about what's going on in the world. Raise your voice against injustice, hatred, and violence. Call for your representatives and your government to take action. Protest - in the streets, on social media, wherever possible - to fight for positive change. 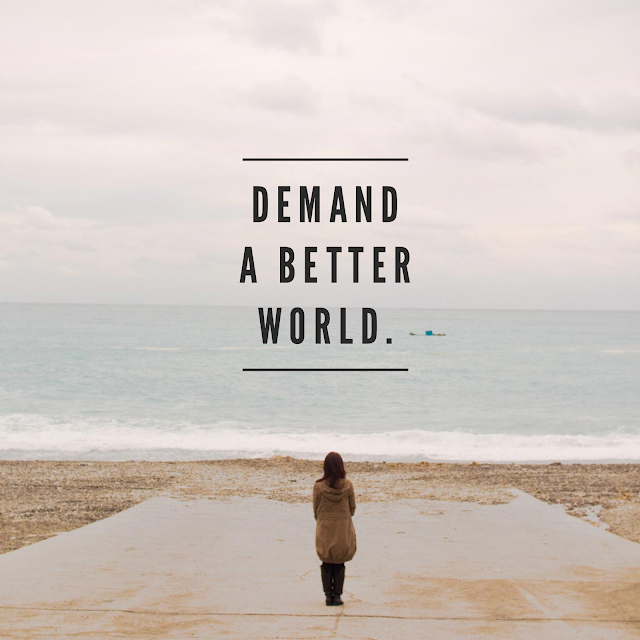 Demand a better world. Make this your New Year's resolution.